Water and electricity do not mix and flooding water tends to be contaminated with soil, debris, chemicals, sewage, oil and other substances that can have negative effects on the functioning of power equipment. 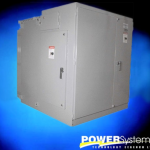 Traditional power equipment is built with this knowledge as a possible outcome, or an evident reality at some point in the life of the power equipment. However, what if we designed electrical equipment and distribution systems to mitigate these outcomes? Besides the increased safety to individuals installing and maintaining the electrical equipment, rethinking how we design our systems could have positive impacts addressing the economic ramifications of flooding. CBC Montreal has reported several economic disruptions in Montreal’s Pierrefonds area caused by severe spring flooding. Their article highlights these disruptions and their affect on the community. Our modern world is powered by electricity, and this is necessary for the functioning of our economy which depends on the powering of businesses, hospitals, schools, and government bodies. Power disruptions today come with economic interruptions and safety ramifications with increased financial costs to all stakeholders. These costs include time and money for maintenance personnel to arrive post flood and safety power equipment re-functioning. What if we re-engineer our traditional power system designs to eliminate or minimize some of these interruptions at the electrical level? The Canadian government recognizes water flooding as a recurring Canadian issue. Our government also recognizes that climate change related weather consequences are becoming more frequent. The need for our industry to discuss how we can alter our designs to better meet our current, and future powering needs feels immediate. Some of our solutions already take flooding into account but we want to do more to assist the industry and our clients with this new reality of flooding and climate change. Join us to share your experiences and ideas on this journey.